Robert De Niro, Burt Reynolds and Chevy Chase for DOG YEARS. 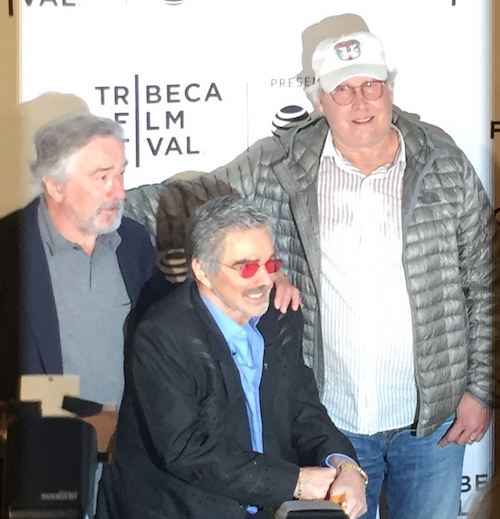 NEW YORK CITY – Taking a well-deserved one more turn around the block, the legendary Burt Reynolds was at the 2017 Tribeca Film Festival representing his new film “Dog Years,” directed by Adam Rifkin, and co-starring Chevy Chase and Ariel Winter. The director and three stars were joined on the Red Carpet by festival co-founder Robert De Niro. CHICAGO – In the latest HollywoodChicago.com Hookup: Film, we have 50 pairs of advance-screening movie passes up for grabs to the new comedy “The Intern” starring Anne Hathaway and Robert De Niro!